Laws and mandates have major changes on the products and services that we use. Markets for goods and services are created and disrupted. An example of this is the Prohibition era in the United States. 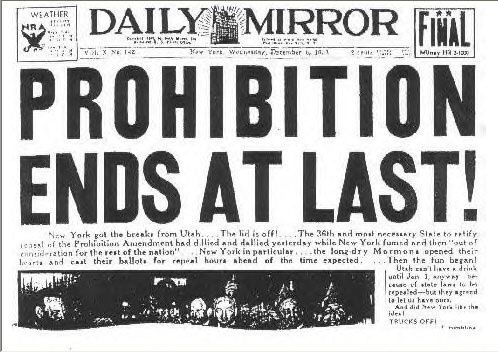 Prohibition was a time when the sale of drinking alcohol was made illegal by States and the Federal government. The logic behind the ban was that quality of life would improve because the consumption of alcohol would decrease. But did this happen? Nope. Instead the sales of alcohol skyrocketed. Bootleggers became rich by selling alcohol. All Prohibition did was disrupt the traditional alcoholic beverage market into a black market. People were able to make a business out of selling illegal alcohol.The same could be said for the sale of illegal drugs. The auto industry also created a new market for the energy conscious with the release of the electric car and the hybrid. These changes created jobs in the green economy. During my time the dental industry, I noticed a surge in product sales of Amalgam Separators. This occurred after an environmental law was passed across the United States; barring Dentist’s from pouring amalgam(mercury) used in fillings down the sewer. Amalgam had to be separated into a separator and disposed of through special means. Think of commercial waste. If you want to see what markets will be created and disrupted; look to the laws and mandates of the government.